Our Brushstroke Dinnerware brings glamour and whimsy to your tabletop. 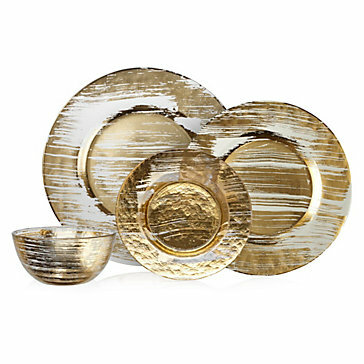 Crafted in clear glass and brushed with broad strokes of gold, this unique dinnerware provides an artistic canvas on which to create your culinary feast. 4.5 Out of 5 Average Rating | 50% of reviews would recommend this product. [value] => I purchased 6 of these in the store. I originally looked at them online and thought they were gold and white but they ARE NOT. It\'s clear but they are still nice. I guess I should have read the description better. [value] => Looks better in person! I can't wait to display these beautiful pieces. I purchased 6 of these in the store. I originally looked at them online and thought they were gold and white but they ARE NOT. It's clear but they are still nice. I guess I should have read the description better. Looks better in person! I can't wait to display these beautiful pieces.